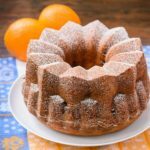 A recipe for a bundt cake made with fresh orange zest and juice, blueberries, and yogurt. It is a moist cake with the taste of citrus and berries. Pre-heat the oven to 350 degrees F. Grease and flour a 10- or 12-cup bundt pan. In a small bowl, add flour, baking soda, and salt. Whisk to combine. Set aside. In a large bowl, add egg whites and cream of tartar. Beat using an electric mixer on high speed until stiff peaks form. Set aside. In a separate large bowl, add butter and sugar. Beat using an electric mixer on high speed until light and fluffy, about 3 minutes. Add the orange zest, orange juice, and vanilla and beat until combined. Add the flour mixture in three additions, alternatively with the yogurt in two additions, mixing on low speed until just combined. Do not over mix. Gently fold in the egg whites to the batter. Fold in the blueberries. Pour batter into prepared bundt pan. Bake for 50 to 55 minutes or until a cake tester or toothpick when inserted into the center comes out clean.